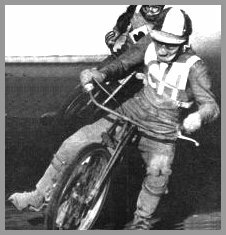 John was a former road racer who started speedway at the Norwich training school in the winter of 1957 - 1958. His first team place was with Yarmouth 1959 in the Southern Area League having 7 matches for a total of 20 points for an average of 5.44. When Yarmouth went into the new Provincial League in 1960 John stayed with them slightly improving his average to 5.70 from 11 matches. 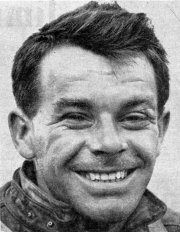 In 1961 he went back to his local track Norwich who owned his contract where he was a reserve/second string for 4 seasons, with his best year in 1962 where he managed an average of 5.28. 1964 was his lowest point when his average dropped to 1.14 from 5 matches, he was dropped from the team and joined Swindon for the rest of the year. In May 1965 John was given a place by Cradley and he stayed for 12 matches until 7th August when he had his last match failing to score against Wimbledon. His best score for the Heathens was against Exeter on 12th June with 5 and 2 bonus from 4 rides. John was one of those people who always enjoyed life to the full, it was good to have him in the Heathens team. Always the joker, good friend of Derek Strutt and were known as the 'Goons', after the famous radio show.